"Mary was espoused to Joseph, before they came together, she was found with child of the Holy Ghost. Then Joseph her husband, being a just [man], and not willing to make her a public example, was minded to put her away privily. "But while he thought on these things, behold, the angel of the Lord appeared unto him in a dream, saying, Joseph, thou son of David, fear not to take unto thee Mary thy wife: for that which is conceived in her is of the Holy Ghost... Then Joseph being raised from sleep did as the angel of the Lord had bidden him, and took unto him his wife And knew her not till she had brought forth her firstborn son: and he called his name JESUS." Painters have been reluctant to take on this part of the Gospel story. There are very few paintings which even show a pregnant Mary, much less a distraught Joseph. 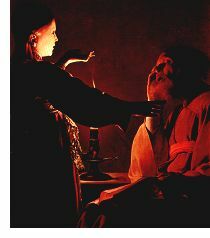 One way to avoid the problem is the way of Georges de la Tour's Dream of St. Joseph.